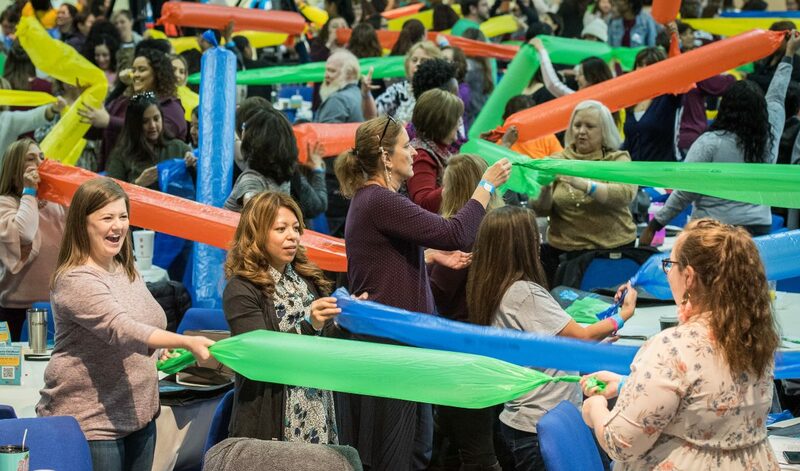 Many wow moments and new ideas were taken away from the 33rd Annual R.T. Garcia Early Childhood Winter Conference, sponsored by Harris County Department of Education and the Teaching and Learning Center. HCDE Assistant Superintendent for Academic Support Services Jonathan Parker welcomed the nearly 1,000 early childhood educators from around the state. “By being here today, you are demonstrating your commitment to your students and the pursuit of excellence,” Parker said. Former HCDE Board Trustee and conference namesake R.T. Garcia was also in attendance and praised the teachers for being first responders to children. This year’s keynote speaker was YouTube celebrity and best-selling author Steve Spangler. He showcased a few of his magic tricks that gave teachers ideas to take back to their students. Deer Park Independent School District Early Childhood Center teacher Vigyatha Gopeechan enjoyed Spangler’s presentation and even took in his second presentation of the morning. This was her fifth year attending the conference. “I enjoyed his session because I can always take back something and show the kids how wow it is because that’s how I feel and it’s awesome,” Gopeechan said. Throughout the day, more than 60 breakout sessions were offered with science activities and how to keep your classroom safe and secure. For many attendees, this was the first time attending and found out about the conference from friends. Kaci Moore is a student at East Texas Baptist University and student teaching at Jefferson ISD. She wanted to attend to learn ideas for her classroom when she becomes a full-time teacher. “I wanted to learn more about early childhood development and how I can bring that into my classroom and use it especially while I am student teaching,” Moore said. Next year’s early childhood winter conference is scheduled for Saturday, Jan. 25, 2020. For more information about the Teaching and Learning Center, visit www.hcde-texas.org/teaching-and-learning-center/ or call 713-696-1315.